With our state of the art photographic equipment and our studios in Hungerford we are perfectly set up to make near perfect copies of artwork of all sizes whether they be oils, pastels, water colours, or any other form of flat artwork. Should your artwork be too large to move or if you have large quantities of artwork for copying, we are able to come and copy items at your studio or home. What is more with our own printing lab on site we are able to reproduce copies of your artwork on a multitude of art papers and canvasses to best suit the original. This service is ideal for artists wanting to create copies of their artwork to sell or simply for sharing art with the rest of the family. For copying artwork at your studio or home we will quote. Please allow up to 15% extra for proofing if an exact match is required. Time takes its toll on all oil paintings and once in a while you should remove the grime that accumulates on the surface of a painting. 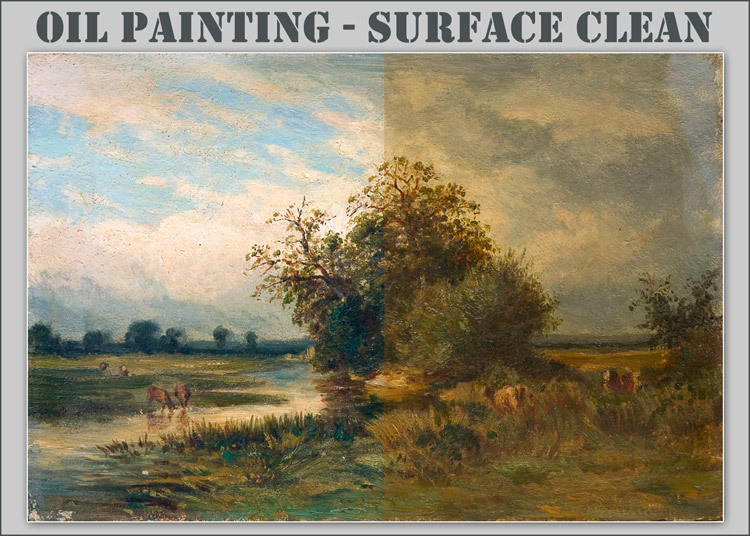 A 20x24 inch oil can be cleaned for as little as �69.00 and the results can be well worth it; please see examples above and prices below. Please note: We make a charge for un-framing and re-framing artwork, these prices can be seen below. In instances where your artwork (oils, watercolours, pastels.....) have become damaged we can restore them to their former glory. 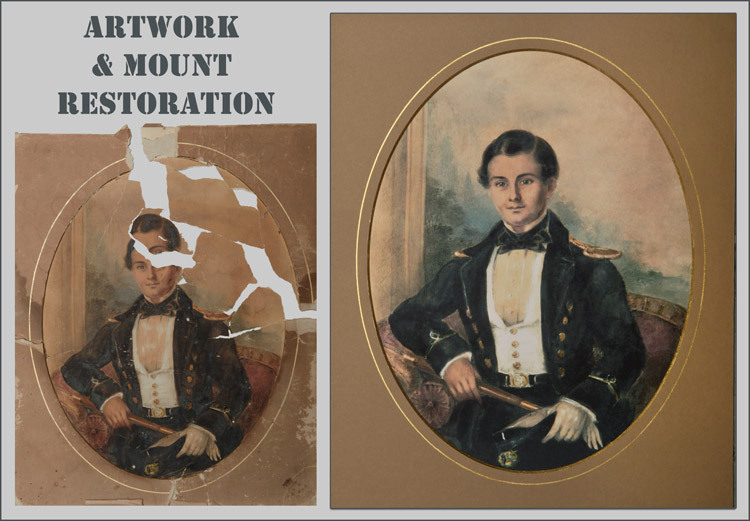 The cost of this service varies hugely depending upon the severity of the damage and once our restorers have looked at your artwork we can provide a full quote along with a time scale for completing the work. 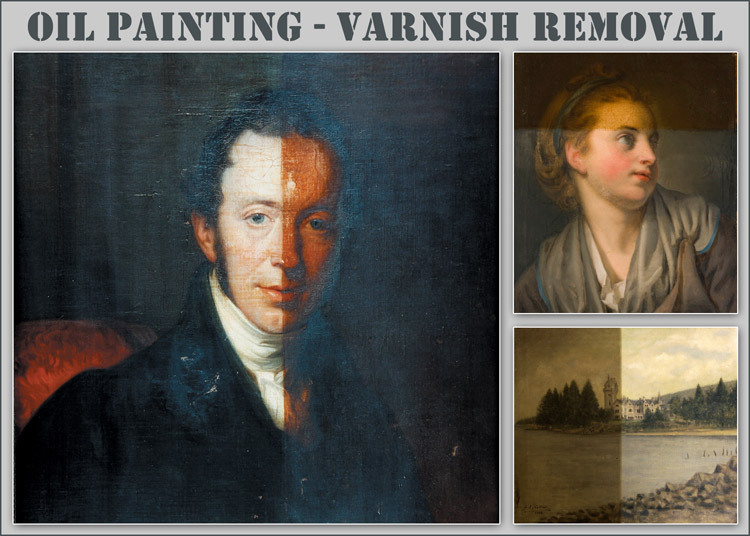 In some cases having your original artwork restored can be an incredibly expensive process. Should you not wish to pay this cost, a slightly cheaper alternative can be to get us to copy the original and then we can digitally repair the copy on the computer. We are able to quote for this work once we have seen the extent of the damage to the original. With our own framing workshops onsite we are also able to restore virtually any frame. Should the original be too badly damaged or too expensive it is more than likely that we will be able to source a matching frame to replace your original.